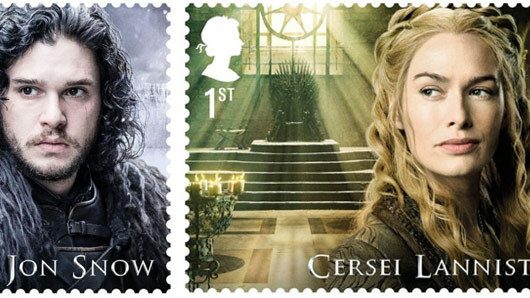 Royal Mail will release a Game of Thrones stamp collection for the New Year. The new stamps celebrate Britain’s contribution to the fantasy series, which is filmed largely in Northern Ireland and stars a majority British and Irish cast. The new range of collectable stamps features characters from the beloved fantasy series, including fan favourites such as Jon Snow, Tyrion Lannister and Daenerys Targaryen. Other characters to receive this honour include Cersei Lannister, Jaime Lannister, Tywin Lannister, Sansa Stark, Arya Stark, Ned Stark and Olenna Tyrell. In addition to the character stamps, five additional stamps on a Stamp Sheet feature the Night King and the White Walkers, giants, direwolves and dragons, and the Iron Throne. Game of Thrones has aired seven seasons worldwide, with the eighth and final series of the epic fantasy scheduled for 2019. It is one of the most successful shows ever, having bagged more Emmys than any primetime TV show in history. The stamp collection will be available to purchase at Post Office branches or by the Royal Mail’s customer service line from January 23. They can also be pre-ordered now on the Royal Mail website.